The figure is likely to go up as details are still being worked out, Senior Deputy Election Commissioner Umesh Sinha told reporters here. NEW DELHI: An estimated 68.70 per cent polling was today recorded in the second and final phase of the Assembly elections covering 93 seats in Gujarat, where Prime Minister Narendra Modi hogged the limelight for a 'roadshow' that has come under the EC scanner. Barring stray incidents of violence, the polling, spread across 14 districts in central and north Gujarat, was peaceful. Modi stood in a queue to cast his vote in a polling booth set up in a school in Sabarmati in Ahmedabad. After exercising his franchise, the prime minister walked a few metres and then briefly travelled on the foot-board of his car flashing his inked finger to the people who had gathered on the both sides of the road. The Congress termed the event as a "roadshow", which, it claimed, violated the Model Code of Conduct. The main opposition party promptly lodged a complaint with the Election Commission (EC), which ordered an inquiry. "Approximately 68.70 per cent polling took place in the second phase of Gujarat polls," a release issued by the office of Chief Electoral Officer B B Swain said. In the second phase, around 2.22 crore people were eligible to exercise their franchise to choose their representatives from among 851 candidates in the fray. "The highest voting was recorded in Sabarkantha district at 77 per cent, while the lowest was recorded in Dahod at 60 per cent. The Ahmedabad district posted the second lowest voter turnout at 63 per cent," it said. In the first phase on December 9, which covered 89 seats of Kutch, Saurashtra and south Gujarat, the voter turnout was 66.75 per cent. In the 2012 elections, the overall turnout was 71.32 per cent for all the 182 seats. As the collection and tabulation of voting data is being carried out, the final polling percentage is expected to be announced tomorrow. Though the voting ended at 5 pm, Swain said that those standing in queue at polling stations would be allowed to vote even after the scheduled closure of polling. While the voting was largely peaceful, two incidents of clashes were reported in Mehsana and Vadodara districts, police officials said. A police officer said at least three persons were injured in a clash between workers of two parties at Hasanpur village of Visnagar taluka in Mehsana district. "The polling process was not affected and the situation was under control," Mehsana Superintendent of Police (SP) Chaitanya Mandlik said. Another incident took place at Wankaner village of Savli taluka of Vadodara district, where some locals got into a scuffle, another police official said. The EC received complaints from five places that electronic voting machines (EVMs) were connecting to external devices via bluetooth (a wireless connectivity technology). But after an inquiry, it was found there was "no substance" in the complaints, poll officials said. Complaints of EVMs getting connected to external devices via bluetooth were received from Patan, Kheda, Mehsana districts, Ghatlodia in Ahmedabad district and Godhra in Panchamahal district. During the first phase of polling, the Congress had complained that some EVMs in Porbandar were connecting to external devices via bluetooth. However, the EC had said the apprehension of possible EVM tampering through bluetooth technology was baseless. The EC today said there were reports of malfunctioning of EVMs and voter verifiable paper audit trail (VVPAT) machines at some places in Aravalli and Panchmahal districts. Despite the morning chill, people queued up outside the polling booths even before voting began at 8 am. Modi, who came here specially to vote, after alighting from his car, bowed to greet his elder brother Somabhai Modi, who lives in Ranip area of Ahmedabad, where the polling booth was located. 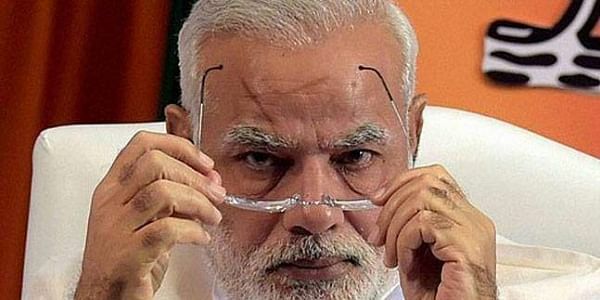 After casting the vote at Nishan High School, he showed his inked finger to hundreds of supporters who had gathered outside the school in the Sabaramati constituency amid chants of "Modi, Modi". Later, he stood on the foot-board of his car and waved to the crowd. Acting on a Congress's complaint about Modi's alleged roadshow, Swain said an inquiry has been ordered to probe whether there was any violation of the model code. Apart from Modi, veteran BJP leader L K Advani, BJP president Amit Shah, Union Finance Minister Arun Jaitley, state Congress president Bharat Solanki and Patidar leader Hardik Patel were among those who cast their ballot. While the prime minister voted around noon, Shah, Jaitley, Deputy Chief Minister Nitin Patel and former chief minister Anandiben Patel exercised their franchise earlier in the day. Advani voted at a polling booth set up in Shahpur Hindi school. The prime minister's mother Hiraba, who is in her 90s, cast her ballot at a booth in Gandhinagar. Hardik Patel and OBC leader Alpesh Thakor, who joined the Congress and is contesting from Radhanpur, Patan district, voted in Viramgam assembly constituency of Ahmedabad district. Gujarat Congress president Bharat Solanki, ex-state Congress chief Siddarth Patel, senior party leader Shaktisinh Gohil and former MP Dinsha Patel also exercised their franchise in the state, where the BJP and the Congress are locked in a high-stake battle for power. Former Congress leader Shankarsinh Vaghela, who has floated Jan Vikalp Front, voted at Vasania village in Gandhinagar constituency. The chief electoral officer told reporters that polling took place in more than 25,000 booths across 14 districts. "We were live web-casting from 1,700 booths. Security had been properly deployed and the staff reached on time," he said. "We gave proper instructions to ensure that EVMs which faced problems were changed in time so as to avoid any delays," Swain said. The elections are being seen as a "prestige battle" for the prime minister and a litmus test for the leadership of Congress president-elect Rahul Gandhi. In the 2012 Assembly polls, the BJP had won 115 seats while the Congress bagged 61. The votes will be counted on December 18.